LOW MILEAGE WHITE ON BLACK F-SPORT! F-Sport Wheels, F-Sport Interior, Sunroof, Bluetooth & MORE! It is extremely hard right now to find ANY Lexus IS250 with the F Sport package under $25k Let alone a pearl white on black one with a clean carfax and under 50k miles. These F Sport Is250's finally are at a great price point. They have been pushing $30k for it seems like ever. 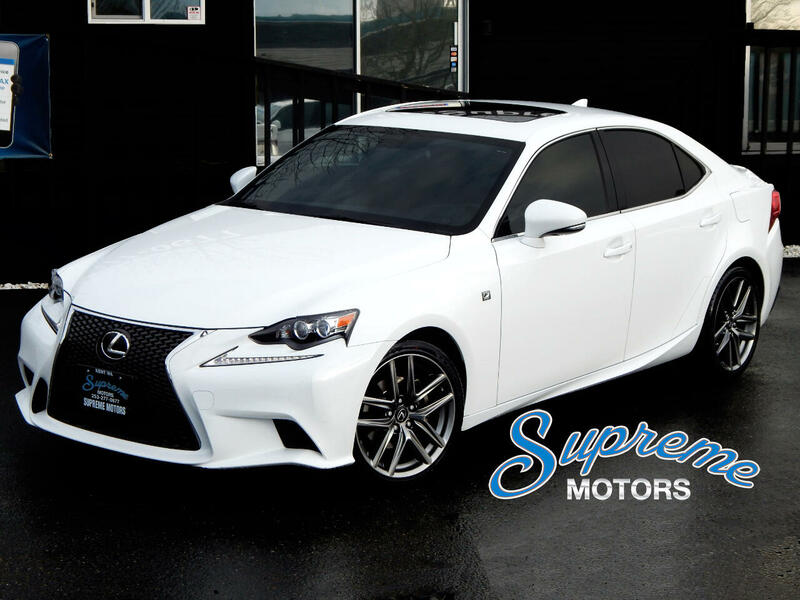 This car has all the curb appeal and the pearl white is the highest sought after color and will hold its value better than any other color combo in Lexus. Its nice to know your car will still be worth great money in 2 to 5 years when you are looking for the next car. The way a car depreciates is "real money" and this one will depreciate slower than almost ANY other $24k car in the market due to it being a Lexus in pearl white and at a bottomed out price point right now.. These engines have been time tested and have proven to be extremely reliable and the new IS 200T's have been having issues. Thats typical when any manufacturer comes out with a new engine, especially when its one of the first engines with turbo like the 200t's. That is why they are much cheaper than the IS250's. Newer but less reliable is NEVER desirable! This car really speaks for itself, with the fact that it is the ONLY white on black F Sport model under $24k. This is a "unicorn in the market" in that it is a clean carfax, white on black, its a 2014 not a 15 or 16 for a couple thousand more at least, just for the year, F Sport, w/ low miles for the year, and hitting a price point that hasnt been hit yet with this exact car. All of these attributes "combined" are what make it hard to find, not just 2 attributes. This is a west coast owned so there is no rust/corrosion issues! Dealers can buy cars from Illinois, New York, East Coast, Midwest Michigan ect with rust for $2500-$5000 less than the same car but from the west coast. Not only is this a west coast car its a 1 owner with no blemishes at all on the Carfax. No accidents or damage reported, minor damages, rental car, or odometer roll backs. At Supreme Motors, we ONLY sell the best of the best and this F-Sport is another prime example of our meticulously inspected, coveted color combination, clean Carfax, and rare optioned inventory that we select for our new clients. The F-Sport package is a must on the IS's! From the more aggressive styling body kit, to the F-Sport logos that are all over it, and the upgraded interior... Dont buy the non F package. The F-Sports will ALWAYS be worth more than the non F-Sports so you can enjoy the upgrades and still retain equity better than the bases. This is also a clean Carfax 1 owner and west coast owned. Call or email with any questions or stop by anytime during business hours.